Travel from Memphis, Tennessee to Tupelo, Mississippi to see the birthplace of Elvis Presley, aka the King of Rock 'n' Roll. See the home where Elvis lived for 13 years, and journey to other sites dedicated to his life during a 2-hour guided tour of Elvis Presley Birthplace Park. Get an early morning start with pickup from your accommodation in Memphis, and relax during the 1.5-hour drive across the Tennessee border into Mississippi. 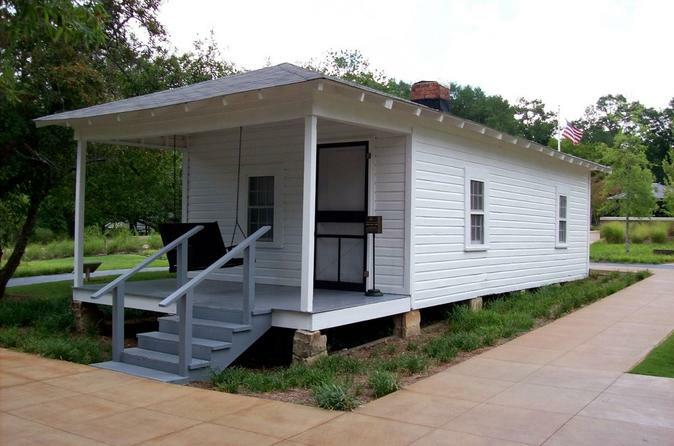 On arrival in Tupelo, hop off the coach to see the modest two-room house, built by Elvis' father, where The King was born and raised. Your 2-hour guided tour features major points of interest that Elvis frequented, such as his elementary school, the Assembly of God church where he was exposed to Gospel music, and the soda fountain where he shared drinks with his friends. Hear tales from his childhood and the beginning of his career, such as the time his mother persuaded him to purchase a guitar instead of a rifle at Tupelo Hardware. At Elvis Presley Birthplace Park, you'll also view a statue of Elvis at 13 years old. See the museum, chapel, a 'Memphis-bound' car, and exhibits including the Walk of Life, Fountain of Life, and Story Wall. Admire the views from Elvis Presley Lake before return transport to Memphis. Note: A minimum of two people per booking is required for this tour.